Set Up Google+ Authorship and Get Visible! You’ve spent a considerable amount of time on and have demonstrated your expertise in the form of creating an elearning course. We at OpenSesame spend a considerable amount of effort and time making your courses available in the search engines whenever your potential customers are looking for them. So now you might be wondering if there is anything else that can be done to improve your chances of getting in front of more buyers. The short answer to that is yes, there are many things, but for today let’s focus on a quick way to help make your course stand out even more in Google. 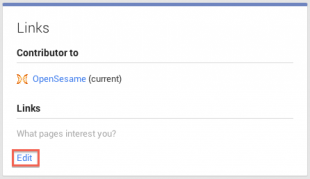 Allow me to introduce you to Google+ Authorship! Chances are good you have seen certain websites in Google appearing with a little headshot next to it like this blog post from our own Katie Hurst. Let’s be honest, the listing with the headshot just draws your eyes more than the other listings without headshots. If I told you it would take roughly five minutes of work to get your headshot to display next to your OpenSesame course listings in Google, would you do it? If you attended our SEO webinar recently, this topic came up, but we ran out of time before we could explain how to set it up. Today, you’ll learn how to get your gorgeous mug next to your seller profiles and course pages in Google. Please be sure to use an individual account for this process, NOT a company page. Choose an employee to represent your organization; we (and Google!) want a human face to show up in search, not just a logo. Head over to https://plus.google.com and create a Google+ profile. If you already have an account, navigate to the “About” section in your profile. There will be a “Contributor to” section where you will first enter “OpenSesame” as the label and “https://www.opensesame.com” as the URL. Be sure the dropdown box to the right is set to “Current contributor” then hit save. Here is a screenshot of what it should look like. Send an email to maximus.kang@opensesame.com with the subject line “OpenSesame – Google+ Authorship – ” and the URL you just copied in the body of the email. We’ll quickly scan your Google+ profile and let you know if we need you to make any other changes or if you’re good to go. a. If dev team can create this functionality internally, use this text: i. Login to your OpenSesame account and in your admin panel, you should see a Google+ authorship submission. Enter your user ID and hit submit. We’ll verify your profile and publish it live on the site. If you did everything correctly, you should be able to check out Google’s markup testing tool to see how your course will show up in Google’s search results. Made it all the way to the end? Please let us know in the comments how easy the process was/how helpful these directions were. Would you be interested in attending a webinar in the next couple weeks to go through the process step-by-step?